Just What Is the Myers-Briggs Assessment Good For? CPP, Inc., is not too happy with you. Well, maybe not you in particular. Rather, CPP — the exclusive publisher of the Myers-Briggs Type Indicator (MBTI) — is unhappy with recruiters and HR departments who use the MBTI as a selection tool. According to Sherrie Haynie, a consultant for CPP who teaches MBTI certification programs, that’s not what the “test” is meant for at all. The MBTI does not evaluate candidates. It does not predict performance or cultural fit or any of the other criteria by which employers hire candidates. Still, a plethora of myths — or “folk tales,” as the CPP calls them — surround the MBTI. Many employers look to the assessment as a way of screening candidates, rather than developing them. 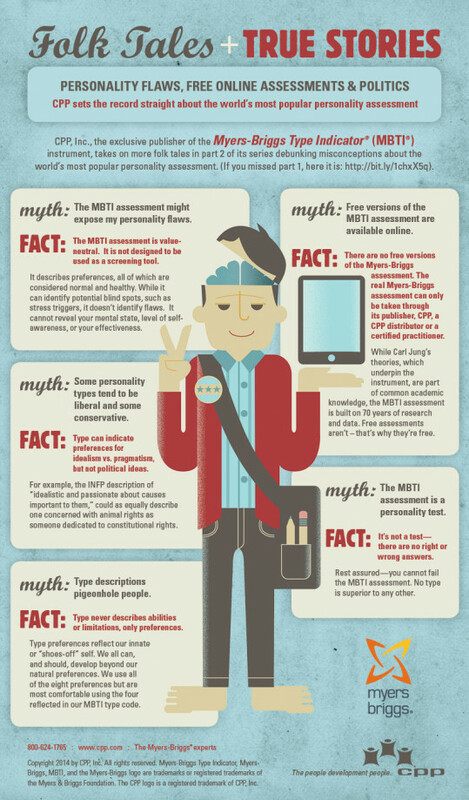 This is why CPP has decided to create a series of infographics dispelling the common misconceptions people hold about the MBTI, one of which is available at the end of this post. It’s difficult to account for all the reasons why the common perception of the MBTI is so far off from the assessment’s actual uses and purpose, but Haynie believes we can partially chalk it up to the ways in which many of us first learn about the MBTI. “It’s often introduced in MBA programs or Ph.D. programs, where participants or students receive a brief overview from someone who does not have direct experience utilizing the tool,” Haynie explains. Because the MBTI is such a specific tool, designed for a specific purpose, CPP requires that all purchasers of the assessment go through rigorous certification processes. This helps CPP ensure the continued relevance and integrity of the MBTI itself, and it also deters misuse of the assessment. Still, Haynie says, CPP has seen a number of employers improperly use the MBTI as a selection tool. “Unfortunately, what happens is someone who is not certified gets their hands on [the test] through an unethical avenue, and they may use the tool for screening,” Haynie says. 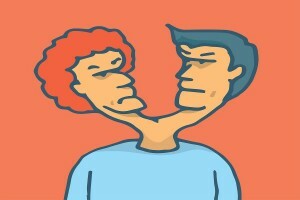 Used as a selection tool, the MBTI can be harmful to individuals. “They’re being judged by a tool that wasn’t designed for that purpose,” Haynie says. This can lead to misguided hiring decisions: qualified, deserving candidates may lose out on positions in which they would exceed expectations, and companies may end up hiring the wrong kind of talent. As Haynie says, the MBTI is a development tool, not a selection tool. Interested employers should use the MBTI to identify employee strengths and blind spots, so that they might help these employees further leverage their strengths and compensate for their blind spots. When employers use the MBTI to identify employee strengths and weaknesses, they can use this knowledge to better help employees grow as workers. Haynie suggests using the MBTI when onboarding a new hire, so as to gain a better view of how the company can leverage the hire’s natural talents. Haynie also notes that the MBTI is useful for building more efficient teams and developing potential leaders. “We can learn to be a better team and be more effective together, if we can leverage each other’s strengths and help each other to overcome and compensate for our blind spots,” she says. It is also important to note that the MBTI does not measure how much of a certain characteristic a person has. That is, the assessment does not evaluate how personable or creative or logical a candidate is. “The Myers-Briggs looks more at innate wiring and a preference for certain characteristics, like extroversion or introversion,” she says. Employers need other tools to measure and compare how much of the behavior people show. The takeaway is that a candidate who tends toward introversion, for example, is not necessarily a candidate who cannot perform an extroverted role with aplomb. The MBTI does not tell us what people can or can’t do — it only tells us what people innately prefer to do.